The European Union’s Civilian Operations Commander Kenneth Deane today reaffirmed the commitment of the European Union Advisory Mission Ukraine (EUAM) to supporting Ukraine’s reform of civilian security sector agencies such as the police, judiciary and security services, and said that EUAM’s new Head, Kęstutis Lančinskas, had the ideal profile to implement the Mission’s strengthened programme of activities. Mr Deane, who is responsible for 10 of the EU’s crisis management missions around the world – including EUAM – was speaking to journalists at the end of a two-day visit to Kiev, where he held discussions on reform efforts with Ukrainian counterparts including the Minister of Internal Affairs, Head of the National Police, and General Prosecutor. 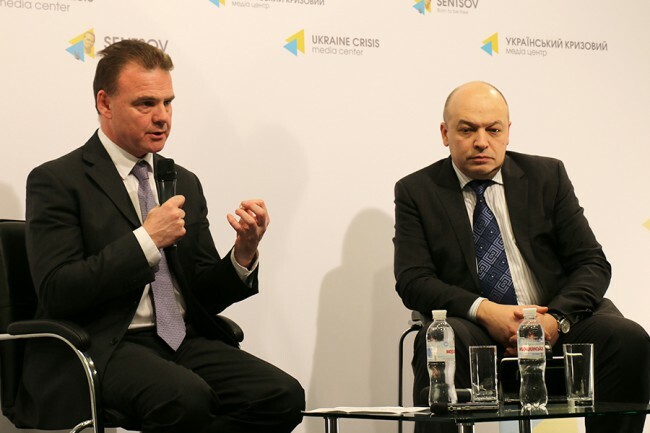 EUAM, Mr Deane explained, is demonstrating its support for Ukraine’s reform efforts through a revised programme of activities that now provides hands-on support such as training and projects initiatives, as well as strategic advice. Mr Lančinskas, who is the former Head of Vilnius Police in Lithuania and who was involved in that country’s reform efforts ahead of its accession to the European Union, said that he is ready for the difficult challenges that lie ahead.